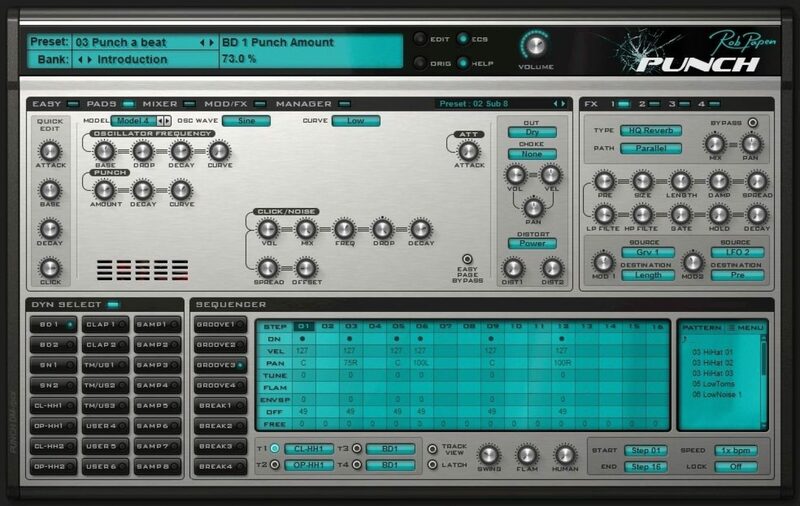 Rob Papen is an increasingly popular software instrument company, and their popular drum machine software, Punch, was released back in 2011. Punch combines synthesis, sampling and sequencing, and puts it all into one package. The idea behind Punch is fairly simple. It uses different synthesizers that are tweaked to be useful for percussion and allows users to tweak the sound further with different envelope and modulation options. The software also includes a sequencer and some sample playback capabilities. One of the great things about Punch is that it’s very easy to use. Even when first opening the plugin, I was happy to be able to almost instantly navigate through the user interface with ease. The sounds themselves can be auditioned on the bottom left of the interface, with the sequencer directly next to it. Above that where sounds are manipulated and effects are applied. After spending some time browsing through the presets, it is clear that a lot of time was put into making them sound good and making effective sounds that “punch” through the music. While subtle percussion can certainly be created using Punch, the instrument is really for making big sounding beats. Once a drum is selected, a number of sound editors will appear, allowing users to manipulate the selected sound. The number of editors varies for each sound. There are four tabs on the user interface to choose from, and when a sound is auditioned, the “Pads” tab is automatically chosen. Other tabs on the instrument include “Easy” which is a quick sound editor giving the user control over things like the filter frequency and the pitch envelope. The next tab on the interface, after “Pads” is the Mixer, which is exactly what it sounds like, giving users level and pan control over their sounds. After that is “Mod/FX”, giving users a number of modulation and effects options. Last up is the “Manager” tab, which allows users to browse through the samples and sounds, or load their own. The preset library in Punch is huge. If you’re not one to sit down and spend time sculpting your own sounds, you’ll be in luck with Punch, as you should find something for every situation. If not, finding a sample that’s close to what you’re looking for and tweaking it a little shouldn’t be a problem at all. It’s important to also remember that a lot of the potential from Punch comes from the ability of users to be able to load their own samples into the instrument. Rob Papen has done a great job with Punch, creating a very easy to use and versatile instrument. I was able to learn the instrument almost inside out with only a few minutes of practice and experimentation, which is something I cannot say for every instrument I’ve used. There is really only one critique that could be made, and that is that some might find the extensive preset library to be too much. Perhaps an easier way to browse samples would have been helpful, but that’s not to say that the way that is employed is not easy to use. Punch should be a great addition to anyones plugin library, and will definitely come in handy for many. You can head here to buy Punch for yourself, or here for other Rob Papen products.